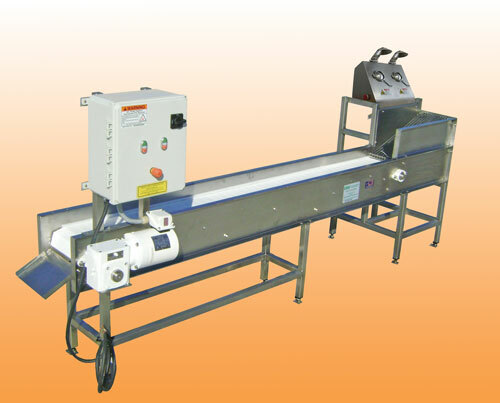 Broccoli Floret Sorting Conveyor with Buffalo Grill Size Separator. Florets fall directly onto Buffalo Grill (small piece separator) small pieces fall through into tub, and larger sized pieces fall down Grill Chute onto Conveyor for Inspection. Includes: Stand for Broccoli Floretter with Mount elevated for easy access to side table. Feet are adjustable height.